The masterminds at LEGO Technic have built the first ever life-size and drivable LEGO Bugatti Chiron. It’s the first large-scale movable construction built using over 1-million LEGO Technic elements, and it’s actually powered exclusively using motors from the LEGO Power Function platform. Using 2,304 motors and 4,032 LEGO Technic gear wheels, the LEGO Technic Bugatti Chiron generates about 5.3 horsepower and 68 pound-feet of torque. Not only is this the first fully-functional, self-propelled life-size LEGO Technic creation, it’s also the first non-glued model this complex. It’s also the first large model powered by the LEGO Technic Power Function Motors and is the first large-scale moving model using LEGO Technic bricks and elements. 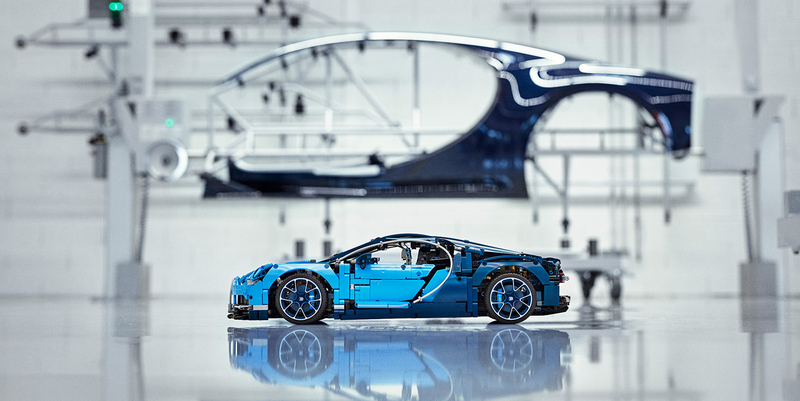 The company also said the Chiron served as the first to create new types of transparent bricks, giving the LEGO creation a unique look. A total of 339 different types of LEGO Technic elements were used in the creation, which weighs 3,306 pounds. There’s also a functional rear spoiler and a speedometer, built entirely from LEGO Technic and LEGO Power Functions and Pneumatics elements. The LEGO Technic Bugatti Chiron made its debut today at the Grand Prix Formula 1 event in Monza, Italy.